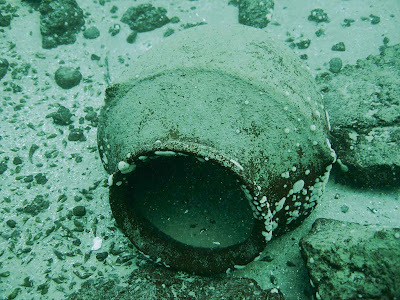 While exploring the underwater Mayan ceremonial site of Samabaj discovered in picturesque lake Atitlan, Guatemala, some 14 years ago, scuba divers came across with artifacts from ancient Mayan ruins, dating back 200-300 B.C. to 300 A.D., which means that these wonderful items have been preserved for 2,000 or 2,200 years. The pieces are of different types and sizes with detail of carvings and color still evident, which is truly amazing. You can see incense burners that are some 1.5 meters high and have four exclusive cardinal points, as well as other remarkable pieces of pottery that are now housed in Museo Lacustre Lago de Atitlan. Lake Atitlan is of volcanic origin and was formed some 85,000 years ago due to a tremendous eruption, which left a large caldera that later was filled with water. The thing is that researchers believe the artifacts once found fifty feet below Atitlan’s surface, were housed on an island until the catastrophic event raised the water level, drowning out the ancient pilgrimage site of Samabaj. The investigations are still in process and the exact location of the site remains a closely guarded secret, since archeologists want to avoid looters who sometimes fish in the ruins. But let’s hope that after finishing the through check, this Mayan site will be open for curious international visitors.